ith millions of people playing World of Warcraft, it is simply impossible for everyone to play together in the same place. This is the reason why the different "realms" were created. A realm is a game world that exists only for the few thousands of players within it. Each realm is exactly the same as any other in terms of the game world, but each realm has its own player characters who are tied to that particular realm. You can interact with all the players on your realm but you cannot interact with players on other realms. Characters also cannot normally move between realms. Realms are defined by name and type. 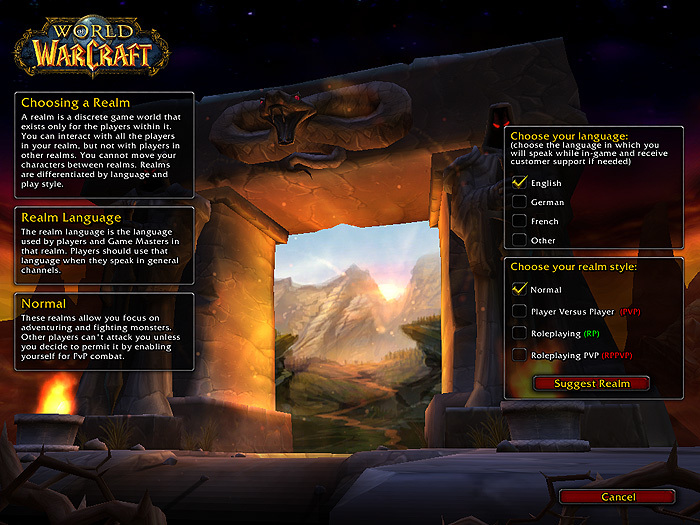 Choosing your realm is the very first decision you will have to make before playing World of Warcraft. In any case, you can speak with, search for, and group only with other players that have created characters of the same faction (Horde or Alliance) and on the same realm as you. Players on opposite factions cannot talk, group, or trade with each other on any realm; their most meaningful interaction will be on the battlefield. World of Warcraft includes both player vs. environment (PvE) and player vs. player (PvP) gameplay. In PvE gameplay, you can do quests, fight monsters, speak, trade, gain experience, learn skills, and advance levels as you would in any other massively multiplayer online role-playing game (MMORPG). In PvP gameplay, you are fighting other players in the wilderness or in special places called Battlegrounds. Sometimes these two gameplay modes can intersect, for example, when a player is attacked by another player (PvP) while fighting a monster (PvE). Because players may prefer one type of gameplay over the other, there are different realm types that emphasize or deemphasize certain gameplay elements, such as PvP. However, the core game will be much the same for any realm regardless of type. The differences between the realm types are detailed below. The two basic realm types are Normal and PvP. The main difference between the two types is the extent of control over which a player can exert on his player vs. player gameplay, and the resulting change to the feel of the game world as a result. In addition, there are special role-playing versions of both realm types for those seeking a more immersive experience in the world of Azeroth. All realm types will have their appropriate appellation (Normal, PvP, RP, and RP-PvP) displayed next to their name on the realm list screen. n Normal realms, the focus of the players tends to center on player vs. environment objectives, such as defeating monsters and questing in the world. Normal realms offer a more accessible way to experience the player vs. environment content of World of Warcraft. On Normal realms, you engage in PvP combat when you choose to. You can activate a PvP option in your character menu, which will indicate your willingness to participate in PvP. This will allow you to participate in world PvP and will automatically be toggled on when you enter a battleground, attack an enemy town guard, or enter an enemy city. Your default state will be with PvP toggled off, meaning you can not be attacked by enemy players. You can think of Normal realms as "truce" realms, where faction vs. faction combat is something that is engaged in voluntarily. You can create both Alliance and Horde characters (but they won't be able to send mail or otherwise interact with each other). There are no "contested" zones in the game; the zones that don't belong to a faction are called "neutral" zones. You can concentrate on quests, harvesting materials, and battling monsters in the world without worrying about being attacked by other players. However, you can't engage in world PvP unless your intended target is also flagged for PvP. The main outlet for PvP experiences will come in the form of battlegrounds, which are self-contained PvP battles consisting of multiple players. Summary: On a Normal realm, you can choose when and where to engage in player vs. player combat. layer vs. player realms have the same PvE objectives and content as Normal realms, but have the added element of perpetual faction vs. faction combat in most of the world. Outside of capital cities and starter areas, the various regions of the world are considered contested areas, meaning PvP combat is possible at any time. That is why you can think of the Player vs. Player realms as "war" realms. On PvP realms, you are in a constant state of war against the other faction. Some game policies are specific to Player vs. Player realms. You should read them before playing on a PvP realm. Each zone of the game has a PvP flag color that shows its PvP status. There are no "neutral" zones. If the thrill of constant danger in the world is what you seek, look no further. You will have a much easier time finding opportunities to fight other players. It is harder to fight monsters and to complete some quests in contested territories. Thus, the PvE game can be more difficult on a PvP realm. If you want some safety from other players while gaining experience, you will have to do instances. Summary: On a Player vs. Player realm, you may be attacked by other players everywhere at any time, except in friendly (green) territories and in dungeons (instances). f you enjoy role-playing (RP) and would like to imagine that you are an inhabitant of a fantasy-based world, then a role-playing realm may be for you. Players who choose to play on an RP realm should abide by the Role-Playing realm policies and remain in-character at all times. Role-Playing realms give players the chance to develop characters with a backstory who do not simply progress from quest to quest, but instead assist or hamper the efforts of others for reasons of their own. As far as game mechanics are concerned, there is no difference between a Role-Playing realm and any other realm. You don't get special benefits or special hindrances other than the behavioral rules you agreed to when joining a Role-Playing realm. Role-Playing realms can either be Normal realms or Player vs. Player realms. Role-Playing realms in the Normal ruleset appear simply as RP realms in the realm list; all game mechanics are the same as on a Normal realm. Role-Playing realms in the Player vs. Player ruleset appear as RP-PvP and again, all game mechanics are the same as on a Player vs. Player realm (for example, on an RP-PvP realm you still cannot attack members of your own faction even if it would sometimes make sense from a role-playing point of view). Please read our Role-Playing Policy before you start playing on an RP realm. If you want to create a "real life" for your character, a Role-Playing realm gives you the best opportunity to do that. You can count on many other players to support you by role-playing their characters too. There are no automatic game rewards for role-playing, and no game mechanics are altered (if you give a rose to a dire bear it will still try to eat you). Not everyone on an RP realm will "stay in character." Summary: If you choose to play on a Role-Playing realm, you should act and speak as your character would in the World of Warcraft setting. he main difference between Normal ("truce") and Player vs. Player ("war") realms is the way PvP gameplay is activated. No matter how PvP has been enabled for a character, the PvP mode will remain in effect for five minutes after the last action that triggers the PvP mode activation. To see whether or not your character is in PvP mode, check your character's portrait. If a shield appears next to your portrait, you are in PvP mode. To determine the status of other players, check the color of their character name (the one that appears over the character's head). Green - Friendly character, PvP mode enabled. Blue - PvP mode disabled; you cannot attack this character. Yellow - Enemy character, PvP mode enabled; this character cannot attack you unless you attack him first or activate PvP mode in another way (see below). Red - Enemy character, PvP mode enabled; this character can attack you, and you can attack this character. Entering a special PvP area, such as Gurubashi Arena in Stranglethorn Vale - this will activate a free-for-all PvP mode where you can even attack members of your own faction! The PvP mode will stay enabled until five minutes after the last action that triggers the PvP mode activation. The PvP mode will stay enabled until five minutes after the character has left the zone or battleground. By typing /pvp, you can activate PvP mode for your character manually. Note that PvP mode will stay enabled until you manually turn it off by typing /pvp again. After you manually deactivate PvP mode, you still need to wait five minutes until your character reverts back to PvE mode. fter you've decided what realm type is best suited for you, the next step is choosing which particular realm of that type to start your adventuring career on. The Realm Status page has a list of all realms, with the type and population of each realm displayed next to their names. Another consideration when selecting your realm is which Battlegroup your realm is part of. This is a concern if you intend on participating in PvP with the honor system or arena system. It's advisable to do some research to make sure you're happy with the mix of servers in your destination Battlegroup. Some Battlegroups have more Normal servers while others have more PvP servers. A few of the Battlegroups are very challenging and are known to have intense PvP with top players. If you are familiar with the Warcraft universe you will also notice that the names of the realms usually reflect the philosophy of their realm type. Normal realms are named after heroes, neutral characters or known places. Player vs. Player (PvP) realms are named after demons and warmongers. Normal Roleplaying (RP) realms are named after beneficial organizations. Player vs. Player Roleplaying (RP-PvP) realms are named after evil organizations or cults. Where am I safe on a Player vs. Player realm? If you are in a friendly territory and you don't attack any enemy players who might be passing through, they won't be able to attack you. And of course, you are safe in instances as they are private places created only for your group of players. Am I safe if I am on a Normal realm and I enter an enemy town (not a capital city)? Enemy players won't be able to attack you but the city guards will. And if you fight back you will activate PvP mode, making you a target for enemy players at that time. May I make friends of enemy faction players on a role-playing realm? You can try to make friends with some enemy players so they will not attack you. But that will not stop other opposing faction players from attacking, and the NPCs certainly will not become friendly. Area effect spells from "friendly" enemies will still do damage to you if you happen to be in their range. Is there any place that allows full PvP, meaning attacking even players from my own faction? You can do that only in very special restricted areas. In Azeroth, only the Gurubashi Arena, in Stranglethorn Vale, and the arena in Dire Maul allow that. No realm type allows complete free-for-all PvP gameplay.